In Great Western Trail, you are rival cattlemen in 19th century America, herding cattle in a circular trail around the state of Texas. Your cattle are then shipped by train, earning you money and victory points. Hire capable staff, such as cowboys to improve your herd, craftsmen to build your cattle posts, or engineers for the railroad line. Upon each arrival at the destination station, have your most valuable cattle in tow. 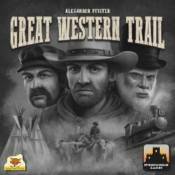 The winner is the player who manages their herd best and exhibits good timing in mastering the opportunities and pitfalls of the Great Western Trail. This game is designed by Alexander Pfister (�Mombasa�).